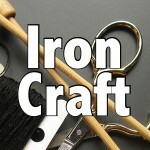 For this Iron Craft challenge we were asked to use the kitchen as our inspiration. The project could be for the kitchen, made from items found in a kitchen or made using a kitchen appliance. I struggled with and idea for this one and then realized I could make something we really needed, a dishtowel that hangs over a bar. Now, I realize this is not the most exciting or original project of all time, but it solved a problem in my kitchen. The only good place we have to hang dishtowels is over the handle of the dishwasher. The problem is I am always finding them fallen on the floor. I wanted a way to attach them to the bar, but I didn’t want one of those crochet topped towels. 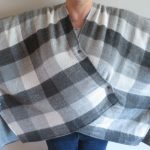 What I like about how I made my towel is that I used the hem of the towel to hide and secure the ends of the elastic loop. It looks neat and like it was part of the original towel. 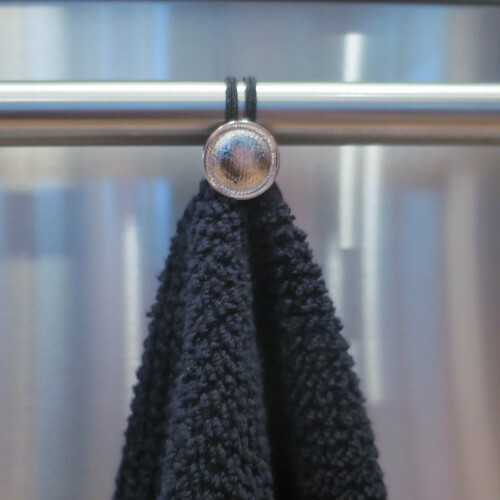 I went with a simple silver button that blends with the stainless in my kitchen to hang mine, but you could use a really fun button or one that matches your towel exactly. This was a super simple ten minute project, but I’ll walk you through the steps anyway. 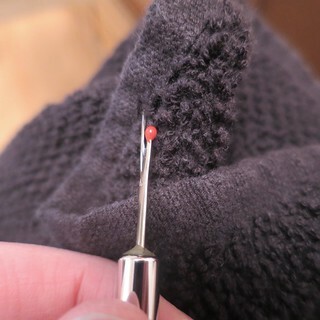 button-One with a shank will be the easiest to button, but any kind will work. 1. Fold the towel in half length-wise to find the center. 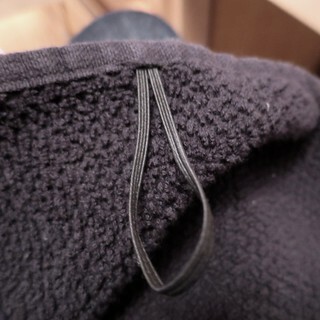 At the center point, use the stitch ripper to open the hem seam just enough to insert the elastic. 2. Cut a piece of elastic long enough to make a loop that will easily fit over the bar you want to hang your towel on. Make sure to include enough length to insert in the hem of the towel. Insert the ends of the elastic into the opening you made in the hem of the towel. Make sure it isn’t twisted. Using thread and needle, sew the opening in the hem shut making sure to sew through the elastic a few times to secure it. Don’t cut the thread yet. 3. 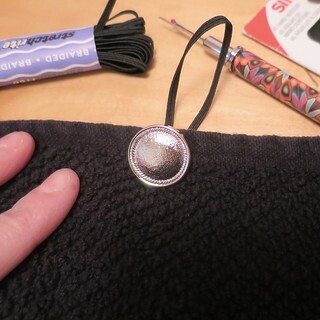 Bring the thread and needle through the towel opposite the loop and sew the button securely into place. 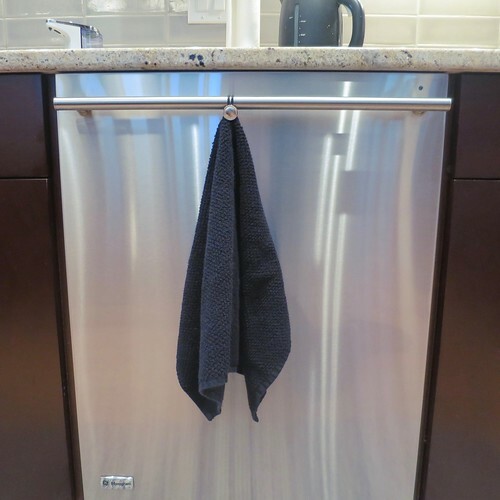 Now hang a towel that won’t end up on the floor every time someone opens the dishwasher or dries their hands on it. I was running low on ideas, too. I do have a plan now, but it’ll be a rush to get it done tonight! Didn’t your dollhouse need a kitchen?! Hah! No, it isn’t going to have one. There are only three rooms, so I’m having a living room, a bedroom, and an artist’s studio! I guess they’ll eat out all the time!